I would like to share this interview with you. Enjoy! I have a desk in what we grandly call the library but is in fact the spare room. The desk is built into the wall in the four foot between chimney and window. It has a set of drawers I keep things like pencils and printer sundries in and a set of 4 shelves above it which have books I’m using for research and reference as well as all my writing related books. I do the majority of my writing on a laptop at the desk. However I also have an iPad and a Bluetooth keyboard for when I travel and I’ve been mostly writing my new novel (The Certainty of Dust) in a blue notebook with a pencil which I’ve scribbled in in various places, most recently on a flight to Poland I took as part of my day job. I don’t. The best advice I’ve been given is don’t have special tools (pens, pencils, notebooks etc.) or any special place to write or activity that needs to be performed. Write anywhere, at any time, with any available writing tool. I drink Earl Grey tea, several cups, before lunch if I’m writing during the day and have a refillable bottle of water for the afternoon and evening. I mostly write in the evening though and usually start any writing with a cup of tea. I don’t usually eat at my desk. I prefer to have a break to have food –when I write in the evening it’s usually after dinner anyway. For someone as bibliovoracious as myself that is such a cruel question! I have somewhere between 1000 and 2000 books on my bookshelves – how could I possibly choose just one? My first published book was a collection of dark short stories, A Tiding of Magpies, which some people have called horror, which use fantasy, scifi and supernatural and psychological horror tropes. The second, Sick City Syndrome, was cross-genre (I called it an architectural fantasy horror) set in the modern day and about urban decay and grief. 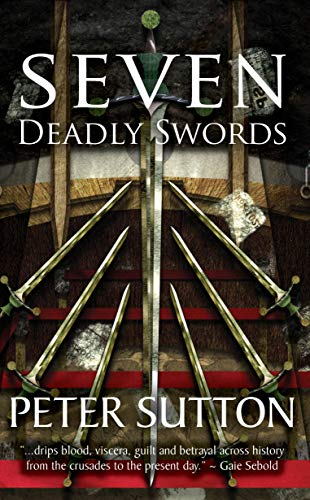 Seven Deadly Swords, as a historical fantasy, is quite different from my previous writing in both genre and tone. The book I’m working on right now –The Certainty of Dust – is more like Sick City. I have plans for an Arthurian low fantasy and an alt-history set in the 1600’s. One of the first guest posts I did was a piece that was entitled “Genre is just a marketing category” and, as I don’t restrict myself to reading just one genre I won’t restrict myself to write in just one either. I think that all characters are gestalts of people you’ve met, people you know slightly and people you know well. Certainly mine are jigsaw puzzles – I may choose the looks of someone with the sense of humour of another and the bad habits of a third. No characters come from whole cloth – even the ones you think are 100% invention can’t really be after all. I used to be conscientious about this, after all it is common advice to authors. I also used to keep a notebook by the side of the bed for those hypnagogic revelations you have on the edge of sleep. Until I realised two things – those revelations never made much sense in the cold light of day and that I had trouble reading my scrawls from the darkness. I tend nowadays to jot myself an email or text message on my phone if I am suddenly struck by inspiration. I do still have a small notebook I slip into a pocket when I’m out too. Not a genre as such but I don’t really get on with YA books – I don’t think I’m the target audience at all and the ones that people have raved about have left me cold. I don’t understand what adults get out of reading them. Tough one. Co-writing could be very interesting but would my ‘process’ (such as it is) gel with someone else? It’s certainly different from Stephen King’s (he overwrites then cuts 25% – I underwrite then add a similar amount.) But assuming that it would I’d like to work with people I can learn things from. 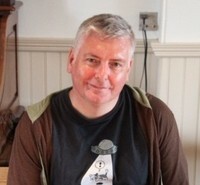 I’d like to work with Mike Carey (MR Carey) – as a graphic novelist he’s used to collaborating and he’s written some great books with his wife and daughter. Neil Gaiman maybe – although his voice is so strong it’d be very difficult I think. Jeff VanderMeer likewise. Nicola Barker maybe. Thank you, Peter Sutton and Love Books Group Tours.